Finklehopper Frog sees all the other animals jogging and wants to give it a try himself. He gets himself a jazzy jogging suit and sets off. But everyone he passes while jogging laughs at his efforts. Luckily, Finklehopper meets a special friend who shows him that having his own hoppin’ joggin’ style is the perfect way to go. 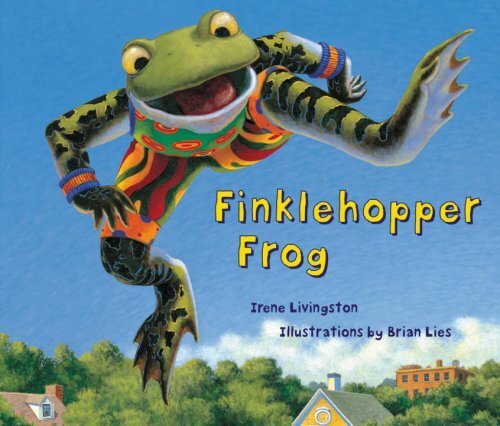 Finklehopper Frog just begs to be read aloud. Kids love listening to the rhythmic prose and looking at the brightly coloured illustrations. The book has a great message around self-esteem and celebrates that we are all different in our own unique ways. It includes lots of action verbs and many examples of regular past tense. The repetition of /f/, /dj/ and /h/ words throughout the book also makes it a good choice if you want to target any of those sounds in your sessions. For further speech and language goals, see the list below.